The Relais Villa Baldelli is secluded in a quiet corner of the Tuscan countryside, enclosed in a park of 8 hectares where the cypresses and the oak trees that surround it give it a great harmony with nature. A small niche hotel that can surprise the traveller because it offers its guests a dimension of peace and quiet, almost mystical, while ensuring various possibilities of leisure just a few kilometres away. 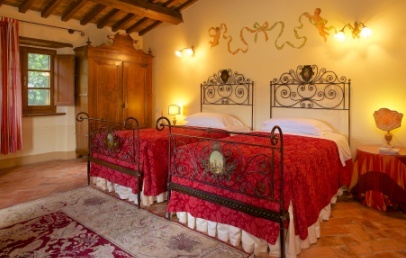 The Relais Villa Baldelli is, in fact, located on the slopes of Cortona (at 3 km), a prestigious city that enhances the best features of the Tuscan region, both for its beautiful nature and for its works of art and archaeological finds. Peculiar is the architectural melange that characterizes it: Etruscan walls, medieval centre and Renaissance palaces, symbol of the historic excursus that has shaped it. 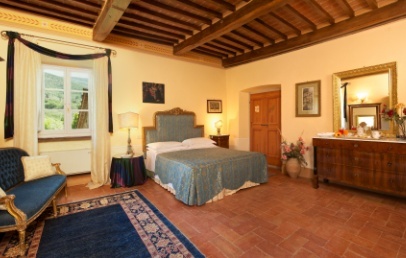 The residence really enjoys a lovely location: in the middle between Arezzo, Assisi and Montepulciano. Once used as a summer residence of the noble family Baldelli of Cortona, today the villa has been turned into a relais of great charm through a skilful restoration. 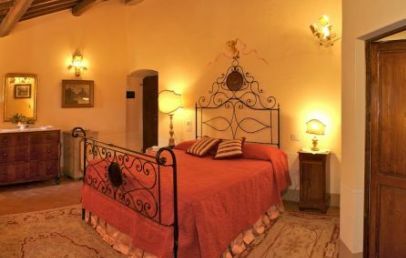 This renovation has kept the original architecture, however, emphasizing the details that make it a unique accommodation, because it retains its mystic charm of an ancient dwelling boasting at the same time the added value of high quality modern services. 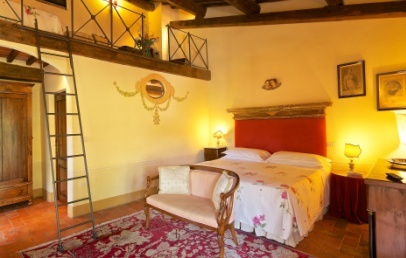 Relais Villa Baldelli is composed of a main building or main house with two floors in which are located part of the rooms. On the ground floor there is the bar, the breakfast room and the Hall with its original decorative elements derived from seventeenth-century altars. From here you can access the relax room adorned with carpets and paintings of great charm, where you can rest reading a good book or enjoying a cocktail. The common areas are all elegant, comfortable, tastefully decorated with prints and paintings. The interiors have retained the characteristics of ancient times with whitewashed walls, brick ceilings with chestnut beams and terracotta floors. This hotel is perfect for an escape from the chaotic modern life providing moments of relaxation and great romance. 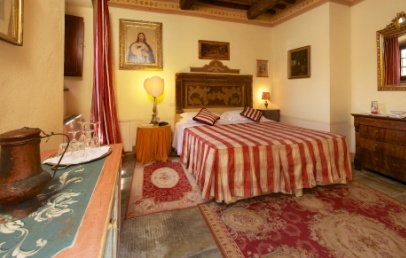 It has 15 rooms spread over the main building of the house and the annexe building of the Relais Villa Baldelli. It offers different categories: Classic, Superior, Deluxe and Junior Suites. 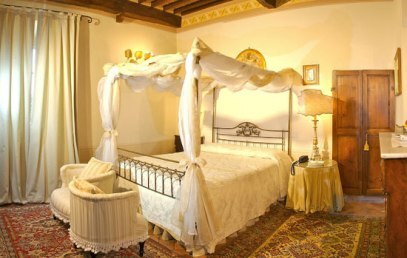 All are tastefully furnished with precious well coordinated antiques and fabrics. All the rooms are different in shape, design and size. The accommodations have a magical atmosphere, they recall the charm of past times, returning to the world of modernity exclusively for the bathroom, which is simple and functional with a shower or bath tub. All rooms dispose as well of the modern facilities such as satellite TV, safe, mini bar, hairdryer, air conditioning, internet connection. Relais Villa Baldelli has a small bar where you can enjoy fine cocktails and a welcoming breakfast room with colourful and full of style furnishing enhanced by a fireplace. This was once the place where the family used to set up the banquets and still today it is the ideal place to start the day in the best way in great harmony and relaxation. The quality of the food offered is combined with an attentive service that takes care of the individual needs of the guests. Reception 24h on 24, free public parking, fax/copier, wireless internet available throughout the hotel against payment. The leisure facilities of Relais Villa Baldelli include a superb outdoor swimming pool surrounded by the vegetation and at 3 km one-hole Golf course with pitch & putt. A short distance from the Relais there is also a riding school at which hotel guests can access for nice excursions in the woods of Mount St. Egidio, or even up to the shores of the Lake Trasimeno. It is also possible to have cooking classes to have the opportunity to get in touch with the renowned Tuscan and Italian cuisine. Being located in the famous area of wine production guests cannot miss the wine tastings, that are organized in the areas of Montepulciano, Montalcino and Chianti. The excursions proposed besides giving the possibility of tasting local foods and wines, they also give the opportunity to get in touch with the cultural background of the towns in the vicinities. The 2 double room Superior are on the first and second floor of the building. They are carefully furnished with antiques and fabrics, well-coordinated. The private bathroom has a Jacuzzi shower. From the windows guests can enjoy a relaxing garden view. Wide Suites inside or outside the Villa. They are finely decorated, furnished with antiques and well-coordinated fabrics. The private bathroom has a jacuzzi shower or bath tub. The Junior Suites outside the Villa offer the convenience of a private entrance and a private garden. From the windows you can enjoy a relaxing garden view. Advance Booking Non-refundable - Book at least 14 days in advance and get 10% reduction on your stay. The Advance Booking rate is a non-refundable one and the total amount of the stay is to be paid upon confirmation.